Like most amazing things, it's easy to miss and easy to mistake. For when things are really great, it just means everything's in its place. 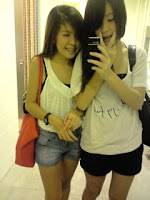 Monday, met up with eldora for dinner in town, did some shopping and slacked at lido for some chitchat session! 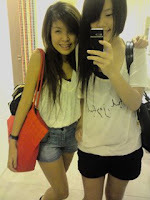 And we went to explore around fe shopping mall when all the shop is like already close. Gosh, all the giggling and stuff. We both had like totally nothing better to do manxx! But its fun! Hahaha, we need to stop going town man princess e! Lets head to like bugis or haji soon! Tuesday, met up with jeslin, town again. Chilled our night away! I remember i can't stop munching the whole while that day when i was out with her. Hahaha, seriously can make me grow fat. Wednesday, met up with joce, val and naz. Had dinner at this random restaurant at marina since we couldn't get our gelare. Arcade and had this three buckaroo random graphic ride, chose the rollar coaster ride, it was like lamee to the maxx, both val and naz went lmao.. Later on macs to chill, l4d and sims3 on naz lappy till midnight :) And i was hoping to get sims3 from naz man asap please! I so wanna play! Hahaha, oh and was wanting to club with joce, randi and marline but din't go in the end, cause imma a real goooody girl. Anyway it was awesome night man!! Seeyou guys real soon alright! Thursday, some idiot woke me up at ten in the morning, dragging me to watch movie with him, thanks man! So transformer and late lunch together. I like the movie^^ Slacked at macs, using lappy again while waiting for eldora and gwen to reach town. We shopped again. L4d for an hour and parted! Ohwell, need to sleep early tonight. I'm like totally lack of sleep. And, i realize i got so many things i wanna get. I'm totally addicted to like shoes. I seems to like everything i see. And i need to patch up my hair colour real soon. :( Ahhh need moos man.